Yes, the chorus of snorers continued into the night. But then they stopped; for later, all was silent. Curiously, snoring seems to be contagious. You never hear just one snorer, but always several, as if one has triggered off the others who then want to compete with the first. Perhaps there are mischievous incubi and succubi which enter the nasal orifices of the sleepers and possess them, causing them to manifest this unnatural behaviour which they later deny. It was chockers last night with not only six of us in one small gite, but four bikes as well. Tonight at Pons I am sharing a large gite with the young Italian pilgrim. The gite is attached to, but not actually in, a medieval Hopital de Pelerins. After I left town, I walked along the river for a while, then up a grassy lane, along the highway past an airforce base, and then across the fields for miles. No vines at first, just cereal crops. The sun was shining, the breeze was blowing, the birds were singing. Oh, what a lovely walk! And then later, on the higher slopes, the grapes. I was taking a short cut through some vines, and a car stopped ahead of me, at the point where I was to leave the vineyard. Was I going to get into trubs? No, it was a former pilgrim who had done the Camino last year and wanted to chat. He put me onto a good spot to stay tomorrow night. 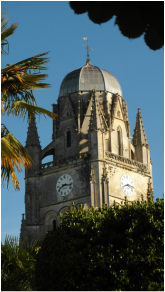 You can see from the photo above at what time I left Saintes this morning. Imagine having that cathedral spire look over you wherever you are in the town! I am convinced that even in this secular age it has an effect on the soul of the inhabitants. Consciously or unconsciously, as they look up at the tower and across at the Roman arch, they must feel a part of history. This afternoon, as I had a beer at a bar overlooking a medieval donjon in Pons, and watched a teacher leading a troop of tiny little kids around it, I thought the same thing: they must absorb history through their very pores. Thus, without realizing it perhaps, they find their place in the vertical scheme of things. And in the horizontal scheme of things as well, as they encounter so many people from different countries passing through their towns. I find that more and more people in the towns I pass through speak English to me in an effort to be friendly and welcoming. Europeans have a sense of their community and their place among their sister nations. I eat dinner on a patio overlooking the hotel de ville and the massive donjon. Rooks circle around the tower and seem to cling to the vertical walls as they find their nests within. Swallows swoop overhead. Raucous lads drink their beer down below. I left the gite before eight, walked under the arch of the pilgrims' hospital, along the road, and back out onto the fields. Corn and beans, now, along with the cereal crops. And vines on the higher slopes, quite advanced, with tiny grapes forming on the stems. A hare bounded along between the rows at the speed of light. Aesop made the right choice. My Italian friend has gone. He has a job at Bordeaux, and had to take a train to get there in time. I would have placed him as a student, or an impecunious fellow in between jobs, but no, he is a freelance photo-journalist, who abandoned a PhD in engineering to follow his passion. He was telling me about a recent story he was doing in a Muslim country on the plight of homosexuals. I won't go into detail in case the secret police are reading this. I wonder if the use of certain loaded words triggers off spy monitors. Perhaps I can increase my readership. That makes three pilgrims I have met and then parted from. I came down from the fields to the town of Saint-Genis-de-Saintonge where I had a pleasant surprise. A bar where I could have the coffee I had missed out on at breakfast! While I was there, I happened to notice a question in a quiz on the TV. What are the three most ecologically minded countries in the world? You have a go. I'll give you the answer later. Sitting across from me was a fellow who sounded familiar. I've heard that voice before, I thought. It was Greengrass speaking French. But there were no other Gallic cousins of the characters in Heartbeat. He didn't look like Greengrass. Nor did he blink with both eyes. But he spoke in fits and starts, and I would have recognized that voice anywhere. Again, the barman spoke a little English to make me feel welcome. Of course, he had friends and family in Canada. 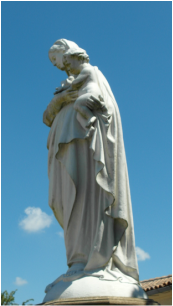 Don't be alarmed by the statue of the Virgin. I didn't pass through Syria this morning. Across the street from the bar, I noticed that the statue had been presented to the villagers by the heirs of the Marquis de Dampierre, who had inhabited a nearby chateau. I speculated. Had he been a cruel tyrant? Had he lost his head to the guillotine? Were his heirs now making amends? Or had the Marquis been a kind master and his heirs were now continuing that kindness? Either way, it seemed a fitting conclusion to a story from the past. Something happened at lunch today. In the morning, I was a little agitated, counting the kilometres, conscious of how far I had to go, but in the afternoon, I was relaxed and walked with a steady rhythm, unconcerned about my progress. I could have walked on forever. Was it the kind words of the barman? Was it the coffee? Was it the Virgin? After my little excursion into religious matters a couple of days ago, a friend wrote that for someone who was not a believer, I could have fooled her. But no, I am not a believer. I had a rather lonely childhood. But a friend dragged me along to his church, and I was made to feel welcome there, and was never indoctrinated in any way. It was a good experience. So I retain a certain fondness for it. But mainstream Protestantism was never incompatible with reason. After all, if God gave man a mind, he was expected to use it. I used it, and so did the theologians whom I read, and we agreed that the virgin birth, the divinity of Christ, and the Resurrection were in fact attributions to an ordinary man by the early Church. Those fundamental tenets of Christianity just didn't stand up to reason and research, and without them there is not much left. Ironically, and sadly, those mainstream denominations where one was allowed to think are now in decline, whereas other leave-reason-at-the-door, just-make-a-leap-of-faith groups are experiencing a huge growth. So I am not a believer, but I still find the subject of religion more interesting than almost any other. Tomorrow, I may return to my thoughts on the anti-religion diatribe I read a few days ago. You may want to give it a miss. On my way to the gite I was impressed by the rugged little church of Saint-Disant. No silver candlesticks there. I guessed that the church reflected the solid, no-nonsense, humble, hard-working farming community around it. I am staying tonight at a farm. Delightful! Chooks are clucking around outside, and inside as well where a door has been left open. A rooster is on patrol, crowing every so often to show who's boss. Cats roam around, and a young puppy, in love with life, frolics about. A donkey watches me from a nearby field. Once in a while he makes a noise like a train sounding its horn at a level crossing. And then he rolls on his back in the sun like a dog. He is rather timid, but his mate, a small horse, is more friendly. I go over and pat him carefully, he and I both wary of the electric fence between us. And now the answer to the quiz. 1. Iceland. 2. Finland. 3. Norway. And Canada? 249th. Probably! When I arrived at the farm last night there was no one there, so I wandered around. I was puzzled by one large room, sparsely furnished, with two outside doors, both left ajar. I noticed a swallow's nest on the ceiling. Later, I learned that the farmer and his wife leave that room open for a pair of swallows that come back each year. "We must look after the animals," he said. Apparently swallows are disappearing from the area. I met an interesting Canadian as well, Boris. He and his assistant were repairing the roof of a nearby church. I don't think I have ever heard anyone speak so passionately about his job. He had an interesting background. Born in Montreal, he had worked in construction in Canada and in Louisiana, before moving to France to study for three years with what seemed to been the equivalent of a medieval guild that taught the restoration of historical monuments. His specialization was roofs, and he is now a foreman in a company that is hired by the state to repair historic buildings. He will never be out of a job. At the end of a day's work, he said, he can look at what he has done and feel that he has accomplished something. He showed me pictures of some of the roofs he has restored. He will be working on a church in Dax when I pass through, so perhaps I will see him again. I walked along the highway into Mirambeau against the traffic. A huge truck whipped off my Tilley hat and pulled it along in the slipstream. For a moment I was afraid it would lodge somewhere on top of the truck and be gone forever, but it finally settled in the ditch. I popped into a bar for a coffee. I was greeted warmly, and one kind gentleman, Jean, wanted to talk about the Camino and insisted on paying for my coffee. I headed out of town onto the minor country roads. A green tractor rumbled up a hill towards me, belching forth black smoke. I held my breath as long as I could to avoid breathing in the pungent fumes. Then an old lady and her dog waited for me at a gate. She gave me a red rose and some kind of white flowering onion. I promised I would attach them to my pack. You will have noticed that I tend to harp on certain themes. One of them is the ripple effect of those Wordsworthian "little, nameless unremembered acts of kindness and of love". Another is religion. I thought again about the piece I had read a couple of days ago. This piece alluded to the story of Adam and Eve , which has been interpreted as justifying the oppression of women by holding Eve responsible for the introduction of evil into the world. According to the orthodox interpretation, which Milton follows in Paradise Lost, Man is cast out of paradise because of Adam and Eve's disobedience in eating the apple of the tree of knowledge of good and evil. Message? Obey God, or else! And because it was Eve who instigated it, she bears the blame. But this is a very strange reading, even for a male priesthood that might want to portray woman as a tempter and reinforce obedience to God, and of course, to God's priests. First, Adam comes across as such a wimp. "She made me do it," he says. Second, Eve appears the stronger character in taking the lead in this pursuit of knowledge of good and evil. Third, God appears petty and malevolent in punishing man for what he was obviously created to do. Who would want to worship a God who punishes man for exercising his God-given reason? Fourth, was man expected to live in blissful ignorance forever? The orthodox interpretation is such a foolish one. How could man be condemned for seeking knowledge? Intellectual inquiry is such an important part of the Jewish and Christian faiths. One of the important aspects of Christianity is the need for man to have the choice between good and evil. Even Milton, that staunch Puritan, insisted that no books should be banned, for the Christian soul must be exposed to evil so that he can make that choice. Biblical scholars have demonstrated that the Old Testament has been rewritten at least three times, as different waves of priests revised it to reflect their current beliefs and reinforce their authority. Sometimes these revisions didn't completely erase the earlier version, and little inconsistencies remain. If the latest wave of priests had wanted to demonstrate the consequences of doing something bad, for which the punishment would be justified, they shouldn't have left the tree of knowledge of good and evil in the story. I prefer to see Eve as representing man's intellectual curiosity, insisting on eating the apple of the tree of knowledge of good and evil, because it will "make one wise". And perhaps the serpent who tempts Eve is really a symbol of the Greek principle, Seek Knowledge. It is strange, though, how the idea persists that ignorance is somehow preferable to knowledge. Perhaps some of you remember some of the sayings we got from our elders. "Curiosity killed the cat" or "What you don't know won't hurt you" or the ungrammatical "Don't ask no questions and you won't get no lies. These belong in the same category as that other classic from a couple of generations ago: "Stop crying, or I'll give you something to cry about!" My point is, however, that there is nothing sexist in this piece of scripture, just in the interpretation of it by certain men over the ages. In fact, it is a myth which feminists should celebrate, because Woman, not Man, is the superior character. And it's a very important myth, because it reveals the truth that man will seek knowledge for the betterment of mankind and our planet, or our destruction. People have often observed that one lives a life in miniature on the Camino, in which everything rushes by very quickly. One meets people, has a meal with them or walks with them for a few days, and then leaves them, people with whom one might have been friends in real life. Experiences are brief, but perhaps more intense. Yesterday, I had a meal with a cyclist, Sebastian, a policeman, who was going to Santiago. We were the only diners in a huge restaurant, with perhaps 40 tables set up, waiting for customers. A cat bounced across the tables. Perhaps that was why we were alone. Sebastian had walked on other chemins in France, but had suffered a serious illness, and was now unable to walk long distances. So he was riding his bike. It would take him about ten days to get to Santiago. It was a memorable meal, and I wish him well. I left Saint-Aubin just after eight, and headed for Etauliers, the first village, six kilometres on. Now that I've left the Departement de Charente Maritime for the Gironde, the concrete bornes with their reassuring little piles of stones on top have been replaced by wooden poles with the coquille, and sometimes the painted yellow arrow that guides you in Spain. Unfortunately, the placing of these markers is not always consistent, so I had to open my guide at times. As I walked along, a tiny rabbit bounded away and disappeared into a hole by the side of the road. Then I saw his brother or sister, squashed flat on the pavement in front of me, victim of "Crass Casualty". Why did one live and the other die? I thought of that great poem, "Hap", by Thomas Hardy. It is hard to accept that our lives are governed by Chance..
And dicing Time for gladness casts a moan. . .
After Etauliers, I had a choice: to take a rather circuitous route to visit some pilgrims' graves, or head directly towards my gite along a cycle path which followed the route of an old railway line. I intended no disrespect, but decided to give the pilgrims a miss and take the short cut. I was musing on another one of my themes - the enlightened policy in France which spends public money so that the "common people can re-create themselves" - when I noticed a tractor with a huge folding lawnmower attachment coming down the path towards me. It was cutting the long grass on either side of the track. I let him go by, when suddenly he put the great machine into reverse and backed up the trail to catch me up. 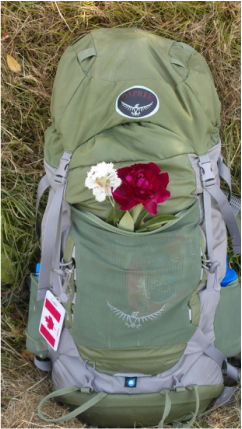 He had noticed the maple leaf on my backpack, and wanted to chat. He had been twice to Quebec, and travelled all around the province, and wanted to tell me about his experiences. We chatted for fifteen minutes or so. He said he would like to live in Canada. I said I would like to live in France. We agreed that it was good to visit another country and experience a different culture. It is interesting that there is no distinction made in France between Canada and Quebec. Les Québécois sont Canadiens. After that, it was easy walking to my gite at Saint-Martin-Lacaussade. Vines covered every square inch of land: grapes as far as the eye can see, slowly growing for the autumn harvest. I am three kilometres short of Blaye, where I catch my boat tomorrow to cross the Gironde. After that, it's a long day's walk to Blanquefort on the outskirts of Bordeaux. I have to leave very early in the morning to catch that first boat. The nearest restaurant is at least a kilometre away, so I've prepared my own meal here at the gite. Pâté, then sausages and lentils from a can, and then cheese, all washed down with a half bottle of Bordeaux. I may not have been as fast as Pheidippides, but it was a marathon nonetheless. I was forced to go right into Bordeaux, because an earlier gite was full. Saint-Martin-Lacaussade is three kilometres from the port at Blaye, where the first boat was scheduled to leave at 7:30. I had to get up at crackers, to make sure I didn't miss it. But when I arrived at 7:15, I wondered if perhaps the first crossing was not until later. The boat was coughing and spluttering, but there was no way of getting on board, and there was no one to take tickets. Then at 7:25, a ramp was lowered at the side of the boat and I was beckoned on. A few cars arrived as well, driving onto the boat from the side, and then parking rather haphazardly towards the stern. It was all very casual. Not like BC Ferries at all. Then we were off, taking 20 minutes for the crossing. I was worried that I wouldn't be able to get any breakfast, but as I got off the boat on the other side, there was a bar du port catering to the boat passengers and others. Alain, a Basque, served me coffee and croissants. He was an eccentric fellow, talking to himself in different languages and bursting into song every so often. Then he came over to me. He had done the Camino and started talking about his experiences. He wouldn't accept any money for the breakfast. I had picked up a little booklet put out by the local association outlining a shorter and calmer route into Bordeaux. This was the route I was following. In fact it was so well marked, that I didn't use the description at all; I just followed the signs. At first it took me across the mud flats on limestone tracks and muddy trails. I was reminded of mangrove swamps in Queensland. There were even mosquitos, not quite up to the quality of our Manitoba variety, but a nuisance not the less. Far more worrying to me was the possibility of midges, tiny little insects which bite but don't bother you right away, but the next day you itch like buggery. Didn't seem to be any. Later I walked along forest trails. It was all very pleasant until it started to rain. It was light at first, and then it pelted down. I was drenched. Two people stopped me and asked if I'd like something hot to drink, but I had to decline, for I had so far to go. Tonight, and tomorrow night, for I'm spending an extra night in Bordeaux, I'm staying in a gite which is actually on the site of the cemetery and used to be the quarters of the gatekeeper. It is quiet! The outdoor patio has a special ambience. Today, I visited visited various sites associated with the medieval pilgrimage. I was given a personal tour by my old friend Marie Jo whom I met on the Camino Frances a decade ago. We visited the Basilique Saint-Seurin, the Cathedrale Saint-Andre, and the Basilique Saint-Michel, timing our visits around the mass in each church. In this way we were able to get into these city churches while they were open. I was rather surprised to find that all three services were well attended. The churches were by no means full, but there were perhaps a couple of hundred in each, and some young people among them. In the photo of the carving above the door at Saint Seurin, Saint James is on the left, holding the staff. Bordeaux is situated on a bend in the Garonne River. The name has evolved from the original Gallic Burdigala, which meant "half moon". Around this half moon, stretch several kilometres of magnificent buildings connected with the wine trade and all the nautical affairs associated with it. Undoubtedly, some of them were involved in a trade for which Bordeaux is less well known, and less inclined to boast about, the traffic in slaves. Bordeaux is the Liverpool of France. Like Paris, Bordeaux is essentially a well planned 18th century town with grand avenues linking the different quarters. Of the middle ages, only the churches, various gates which once allowed entry through the city walls, and little winding streets away from the main thoroughfares, remain. In the afternoon we visited a wine museum and saw everything involved in the making of wine from bungs to barrels to bottles. I learned that the Bordeaux wine region comprises five separate regions, each producing a different wine because of the different soils. Apparently, the wine from the poorest soil can be kept the longest, whereas that from the richest has to be drunk within five years or so. When I get home, I had better get stuck into those bottles that have been sitting in our garage for a while. Apparently a young wine should be decanted; an old wine, never. Included in the price was a tasting, and I was looking forward to this. We began with a white, which I sipped and then discarded. It was a tasting, not a drinking, said our guide, but I was saving myself for the reds. We tasted a rather light red, and I was just settling in for what was to follow, when that was it. Only two glasses! A far cry from those great tastings where strangers become friends and everybody ends up singing. Until modern times, Britain was the major market for wines from Bordeaux. I remember reading that the English produced their own wines until they tasted wine from Bordeaux. Perhaps that is why the city remained one of the last parts of France to be occupied. I was told that the Bordelaise have a reputation for keeping themselves to themselves, and that they attribute this introvertedness to their English connection. To my mind, the most magnificent monument is the remains of a Gallo-Roman arena. As I stood there, I realized that I was at the end of the great Roman road I had walked along on the way to Poitiers. It was a great day, and I probably walked as much around the town as I would have done on the road.